Pat Falco with his installation of signs at the Faneuil Hall Marketplace space. Feeling queasy about politics? 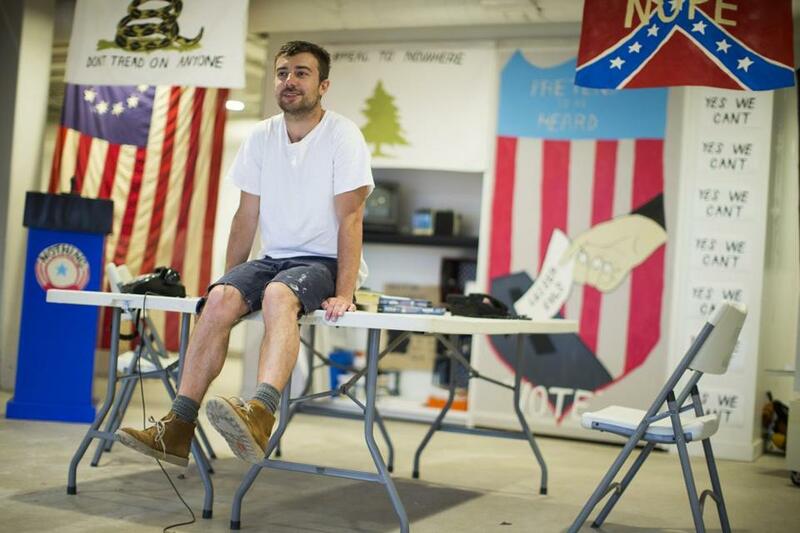 So is artist Pat Falco, whose installation “Boston Campaign Headquarters” opened June 14 at Faneuil Hall Marketplace’s South Market Building. It will stay up through August. Like any local campaign office set up on the fly in a retail space, “Boston Campaign Headquarters” has signs and campaign buttons. It even has a podium, should a candidate need to speak. But it’s all tongue in cheek. “Yes we can’t,” reads one sign. “The silent majority: Because it’s too embarrassing to say out loud,” says another. Atop a selection of donation boxes: “Tired of just one vote? Pick a super PAC that works for you.” And on the floor, the artist has painted a red United States with a large, blue Massachusetts. An eagle flies above it, shedding tears. 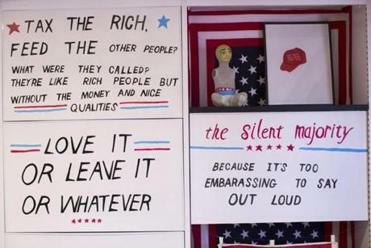 “I don’t know if it’s nonpartisan, or anti-everything,” said Falco, a conceptual artist who specializes in familiar-seeming signage that upends the expected message. A campaign office seems right up his alley, but it wasn’t his idea. He’s here at the invitation of Susan Battista and Fritz Klaetke, who own 1630, the pop-up gift shop next door, which specializes in locally made and vintage merchandise. They were only using half the space of their short-term rental. “Fritz and I recognized that when people came in to our shop they were talking about the election,” said Battista. The pair also owns Visual Dialogue, a branding and design company. To stir the pot, they thought of a Boston campaign headquarters, and invited Falco to run with the concept. 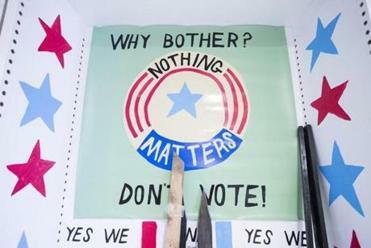 While Falco has already covered his walls in red, white, and blue signs, he says he’ll continue to create work as election season drags on. Visitors can pass through 1630 to get to the installation, or, as Connie Rizoli of Westwood did last week, they can come in the front door. She read everything, occasionally laughing out loud. Falco agreed that cynicism underlies his work, and he thinks that’s useful. A candidate using that kind of language would never get elected. But might politicians appreciate the parody? Falco said he has a cousin in politics who offered to try to get Hillary Clinton to stop by. “I don’t think she’d come in,” he said, looking around at his signs.